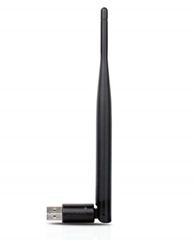 DWA-127 Wireless N 150 High-Gain USB Adapter is a convenient wireless connectivity solution for desktop or notebook PCs. Instead of stringing Ethernet cables to your PC or dismantling your desktop computer case, the DWA-127 can enable 802.11n wireless connectivity by simply utilizing your desktop or notebook PC’s USB port. Powered by Wireless N 150 technology, the DWA-127 provides a faster wireless connection and superior reception than 802.11g. The DWA-127 is designed for use in bigger homes and for those that demand higher networking. Maximize wireless performance by connecting this USB Adapter to a Wireless N router and stay connected from virtually anywhere in the home. This USB Adapter supports WPA and WPA2 encryption to prevent outside intrusion and protect your personal information from being exposed.